Patients with primary breast cancer might consider three surgical options: modified radical mastectomy (MT), MT with contralateral prophylactic mastectomy (CPM), and breast-conserving surgery (BCS). Following BCS, radiation therapy (RT) is often required to reduce the risk of ipsilateral breast tumor recurrence, although older patients with indolent tumors may not require radiotherapy after BCS. Moreover, radiotherapy is required for selected high-risk patients who undergo mastectomy. Relative contraindications to BCS include pregnancy, previous breast RT, active collagen vascular diseases, large tumor size in relation to breast size, multicentric disease, and mutation carriers (who are generally treated with bilateral mastectomy for unilateral breast cancer). Preoperative chemotherapy can be utilized to decrease the size of large tumors, allowing BCS to be feasible. Most women with primary breast cancer prefer the option of BCS with adjuvant RT. 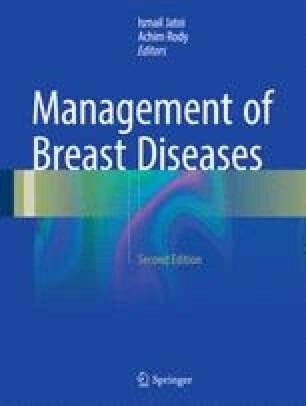 Paradoxically, there has been a trend in recent years toward the increased utilization of bilateral mastectomy (MT + CPM) for the treatment of unilateral breast cancer, despite a decreased risk for the development of contralateral breast cancer due to improved adjuvant systemic therapies. Sentinel lymph node biopsy (SLNB) is useful in determining the status of the regional lymph nodes while avoiding the morbidity associated with a more extensive axillary lymph node dissection (ALND). Multiple published randomized controlled studies have demonstrated the safety of omitting ALND in women with negative SLNB. Recently published randomized studies have provided evidence that SLNB alone is safe, even in instances where patients have a low burden of axillary disease in the sentinel nodes, particularly if these patients receive adjuvant radiotherapy and adjuvant systemic therapy. Institute nc. surveillance epidemiology and end results program (2014) Available from: http://seer.cancer.gov. American Joint Committee on Cancer Breast Cancer Staging 7th edition. Available from: https://cancerstaging.org/. Accessed 28 May 2016.